There's no getting around the allure of motorcycles. Since 1885, when Gottlieb Daimler mounted a gas-powered engine on a wooden bicycle, riders of all ages have been drawn to the exhilaration and terror of motoring in the open air on two wheels. Motorcycles have become ingrained in our culture. To some, they represent the ultimate expression of freedom. 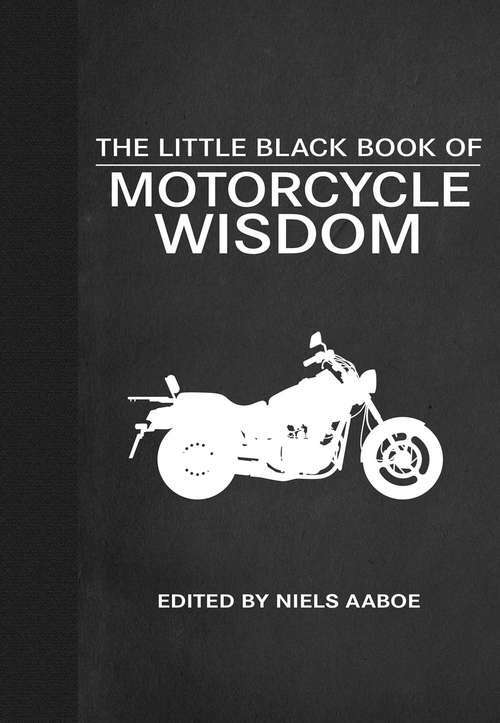 To others, motorcycles symbolize lawlessness and disrespect for authority.The Little Red Book of Motorcycle Wisdom is packed full of wise, witty, and edgy quotes on motorcycles and the people who ride them. Celebrities, literary giants, and athletes offer pithy and memorable comments on what they ride, where they ride, with whom they ride, how fast they ride--and, most importantly, why they ride. Read musings on bikes from such noteworthy folks as:Hunter S. Thompson Marlon BrandoRobert Pirsig Evel KnievelSonny Barger Ewan McGregorSteve McQueen Leonardo DiCaprioPaul Newman Bob DylanHugh Laurie Angelina JolieT. E. Lawrence And dozens of others!There's a reason why people the world over are passionate about a machine that has been dubbed "the perfect vehicle." This book tells you why.